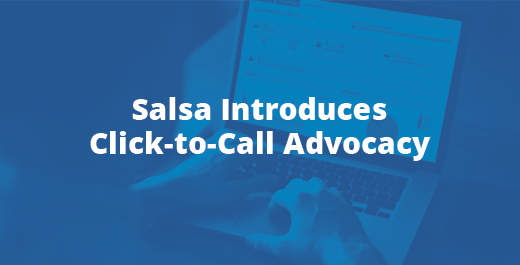 Bethesda, MD — November 1, 2017 — Nonprofit software leader Salsa Labs (Salsa) is excited to announce the addition of Click-to-Call functionality to it’s multi-channel advocacy platform in Salsa Engage. Click-to-Call actions enable Salsa Engage campaign managers to connect grassroots supporters to their specific legislators via telephone, while providing them with scripts and talking points relevant to their organization’s agenda, and to record data to identify and interact with their most passionate supporters. Click-to-Call joins a multi-channel advocacy platform that already includes the ability to quickly build online petitions and target Federal, State, and Local legislators with email messages and direct Facebook and Twitter messages. Salsa Engage also provides legislator lookup, a grassroots advocacy dashboard, and a robust mobile-ready marketing automation platform. In the coming weeks, Salsa will be releasing new product features that focus on helping nonprofits dramatically grow and retain brand new supporters.